Disability can be caused by amyotrophic lateral sclerosis (ALS), multiple sclerosis, cerebral palsy, spinal cord injury, brain injuries and stroke, muscular dystrophy, among others. Limited mobility and communication due to disability will limit patients’ personal freedom and lead to a low quality of life. In particular, for ALS patients, they may eventually lose the ability to speak, eat, move and breathe, and there are 30,000 people live with ALS, 6000 new cases per year. We develop an eye gaze based assistive technology EyeCanDo, that enables patients with speaking and muscle movement disability to freely connect to the world, communicate with people through a simple smart device, such as iPhone or iPad. Users will be able to use their eyes to control EyeCanDo app to interact with smart home devices, messaging, speaking, reading, and entertainment. This will increase patients independency and can significantly improve the quality of their life. 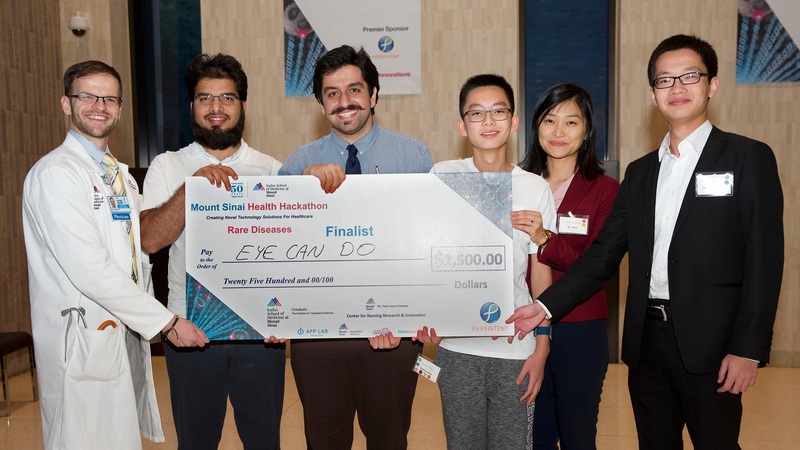 This idea was firstly developed in the Mount Sinai Health Hackathon 2018 for rare diseases. During the three days competition we successfully built a working prototype which was running on iPhone. The video from our pitch is available here. Our team was chosen among three finalists by the judges committee consists of 6 people with different expertise in related domains. We won one of three $2500.00 prizes. In case you are interested to collaborate with this project or be aware of possible beta testing in near future, please do not hesitate to contact srashidian [at sign] cs [dot] stonybrook . edu. Please put the keyword “EyeCanDo” in the subject of your email.